The exhibition The last avant-garde presents a survey of design in Italy in the 1960s, 70s and 80s. In these years design studios such as Archizoom, Superstudio, Alchymia and Memphis and designers such as Andrea Branzi, Ettore Sottsass and Matteo Thun developed a radical new vision of design and society. The architectural experiments, suggestions for utopian housing and playful designs they presented have lost none of their topicality. 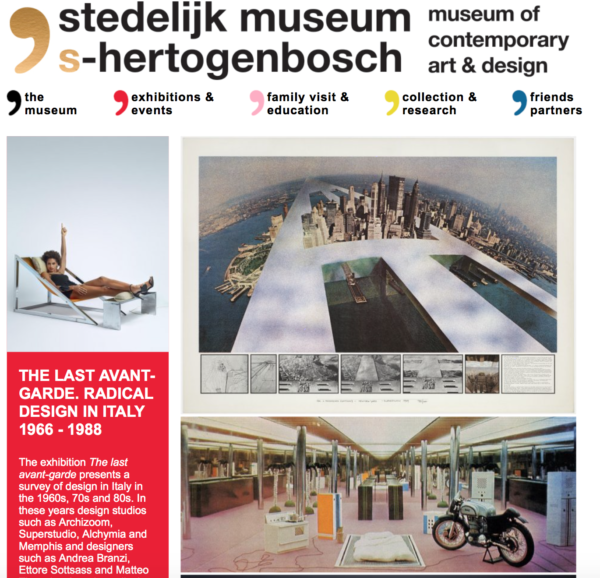 This is the first time that an overview of the last Italian avant-garde is presented in an exhibition in the Netherlands. March 10, 15:00 at the Stedelijk Museum. with a rare screening of the 8 short films produced for the original exhibition.